The year is 1880. Two hundred years after the trials in Salem, Adelaide Thom ('Moth' from The Virgin Cure) has left her life in the sideshow to open a tea shop with another young woman who feels it's finally safe enough to describe herself as a witch: a former medical student and "gardien de sorts" (keeper of spells), Eleanor St. Clair. Together they cater to Manhattan's high society ladies, specializing in cures, palmistry and potions--and in guarding the secrets of their clients. All is well until one bright September afternoon, when an enchanting young woman named Beatrice Dunn arrives at their door seeking employment. Beatrice soon becomes indispensable as Eleanor's apprentice, but her new life with the witches is marred by strange occurrences. She sees things no one else can see. She hears voices no one else can hear. Objects appear out of thin air, as if gifts from the dead. Has she been touched by magic or is she simply losing her mind? Eleanor wants to tread lightly and respect the magic manifest in the girl, but Adelaide sees a business opportunity. Working with Dr. Quinn Brody, a talented alienist, she submits Beatrice to a series of tests to see if she truly can talk to spirits. Amidst the witches' tug-of-war over what's best for her, Beatrice disappears, leaving them to wonder whether it was by choice or by force. To ask other readers questions about The Witches of New York, please sign up. Should you read The Virgin Cure before reading this? How have you all read this book if it's not published yet? Amanda - Go Book Yourself Book bloggers and reviewers are sometimes sent advanced review copies. The Victorian age, late 1800's, a time when many were very attuned to their dead. They took photographs of them, fashioned jewelry from their hair, and tried to contact them in the great beyond. Many were there to take advantage of them, in any way and means possible. Charlatans abounded, but were there actually some who had the magic the power to see and communicate with the deceased? In a little tea shop, three women know they can, all have powers to a different degree. One in fact Adelaide, wa The Victorian age, late 1800's, a time when many were very attuned to their dead. They took photographs of them, fashioned jewelry from their hair, and tried to contact them in the great beyond. Many were there to take advantage of them, in any way and means possible. Charlatans abounded, but were there actually some who had the magic the power to see and communicate with the deceased? In a little tea shop, three women know they can, all have powers to a different degree. One in fact Adelaide, was Moth in this authors novel, The Virgin Cure. These there woman are wonderful characters, the tea shop an intriguing mix of surprise and wonder. The dearlies, in charge of dreams, were fun and a giant bird, who is more than a bird, was knowledgeable and humorous. The characters are those on the fringe of society, the bird woman, who sits on a park bench and surprises with her wry but insightful comments, and others. A delightful blending of witch-hunting by a Reverand who feels it is his mission to stamp out evil, and some real history.The suffragette movement and the arrival of an important artifact. This is a book with a glorious atmosphere, a sprawling endevour to lose oneself in, an amazing mix of history and magic. Loved the author's afterward where she explains how she came up with her ideas for this novel. I'm very glad she did. On a windy, autumn day, Ami McKay's Witches of New York turned out to be the perfect seasonal read. Last year I was captivated by Rules of Magic, so there is something about witches and New York City that is just, for lack of a better term, magical. McKay takes readers back in time to 1880 New York where witches were no longer burnt at the stake but were still persecuted for being different, powerful women. This is the scenario that McKay has created for her protagonists as well as the secondary On a windy, autumn day, Ami McKay's Witches of New York turned out to be the perfect seasonal read. Last year I was captivated by Rules of Magic, so there is something about witches and New York City that is just, for lack of a better term, magical. McKay takes readers back in time to 1880 New York where witches were no longer burnt at the stake but were still persecuted for being different, powerful women. This is the scenario that McKay has created for her protagonists as well as the secondary female characters as they struggle to assert themselves in a modernizing world. The 1880s while modern still has room for plenty of Magic. New York City was not yet lit by electric light so did have the moniker the city that never sleeps. Yet it was home to the women's suffrage movement, temperance movement, and a slew of women looking for increased rights in a still new nation. Tucked near the bustling fifth avenue we find St Clair and Thom's Tea and Symphony Shop where witches Eleanor, Adalaide, Beatrice concoct potions, spells, and of course teas to assist women from all walks of life as they face the challenges of a modernizing society. Chastised for being witches, the women are powerful in their own right yet stronger together and draw on their magical families and friendship to overcome those who still thought of witches to be menaces to society. McKay creates characters with rich histories and freely flowing story that I literally read in a day. The writing was not spectacular but the something about magic, witches, New York City, and the gilded age are elements that I always enjoy reading about. Together they create an atmosphere of hope that is electric, and I fell for the characters from the first pages. Having read Harry Potter countless times, especially at this time of year, I'm always on the look out for books that contain elements of magic to them. Witches of New York, while not the best of writing, for fit the bill perfectly, especially on a crisp, windy, fall day. As a lover of all things witchy, this book is totally up my alley. I loved how McKay looks at women's histories in The Birth House and The Virgin Cure but I think this is my fave of her books. Adelaide, Eleanor and Beatrice are three independent women in a time and place (1880s NYC) when it wasn't exactly easy to be an independent women. They are brave, vulnerable, prickly, resourceful, stubborn, and utterly charming. I desperately wanted to visit their tea shop, have my leaves and maybe my pal As a lover of all things witchy, this book is totally up my alley. I loved how McKay looks at women's histories in The Birth House and The Virgin Cure but I think this is my fave of her books. Adelaide, Eleanor and Beatrice are three independent women in a time and place (1880s NYC) when it wasn't exactly easy to be an independent women. They are brave, vulnerable, prickly, resourceful, stubborn, and utterly charming. I desperately wanted to visit their tea shop, have my leaves and maybe my pal read, and then leave with hibiscus tea. 3.5 stars. I enjoyed this one; the characters are well developed and the plot is interesting. The book is beautifully formatted, with lots of drawings throughout and pictures of old newspaper clippings inserted between the chapters. This is a pro-witchcraft, feminist tale about two witches, Eleanor St. Clair and Adelaide Thom, helping a new witch, Beatrice Dunn, find her place in the world. Beatrice comes to New York in September 1880 to make a new life for herself, little knowing she has acquire 3.5 stars. I enjoyed this one; the characters are well developed and the plot is interesting. The book is beautifully formatted, with lots of drawings throughout and pictures of old newspaper clippings inserted between the chapters. This is a pro-witchcraft, feminist tale about two witches, Eleanor St. Clair and Adelaide Thom, helping a new witch, Beatrice Dunn, find her place in the world. Beatrice comes to New York in September 1880 to make a new life for herself, little knowing she has acquired unique gifts that will steer her life in an unexpected direction. It was a bit slow in places, (lot's of tea making and chat that doesn't move the story along) and there's tons of information about the rituals and lore of witchcraft which sometimes distracted from the story. There are also a couple of characters who could have been eliminated as they're completely unnecessary. This book is both a charming magical realism tale and a creepy, suspense thriller. Some sections read like an episode of Criminal Minds. All in all, well worth a read for those who enjoy magic and good witches. I enjoyed reading THE WITCHES OF NEW YORK by Ami McKay and found it interesting, engaging, informative and well written. I liked the historical references, and was intrigued by the three main characters and Perdu, who looks like a raven, but is not a bird. Adelaide Thom, claiming to be a mind reader, and Eleanor St. Clair, a keeper of spells, have a tea shop specializing in cures, potions, and palmistry and cater to Manhattan's high society ladies. When Beatrice Dunn, a girl of sixteen and inter I enjoyed reading THE WITCHES OF NEW YORK by Ami McKay and found it interesting, engaging, informative and well written. I liked the historical references, and was intrigued by the three main characters and Perdu, who looks like a raven, but is not a bird. Adelaide Thom, claiming to be a mind reader, and Eleanor St. Clair, a keeper of spells, have a tea shop specializing in cures, potions, and palmistry and cater to Manhattan's high society ladies. When Beatrice Dunn, a girl of sixteen and interested in magic, shows up at the tea shop, something happens! Having enjoyed reading this book and The Birth House by Ami McKay, I wish to read The Virgin Cure also written by her. "They'd lived there, just the two of them, in a house so large that even their shadows occasionally got lost." 'May you rise with the sun, ready to make hay. May the rains come at night to wash your cares away. May you sleep with the angels sittin' on your bed. "Careful what you wish for, lest you receive it." I am excited to add that I did get to meet Ami McKay and hear her read from this book! I think that everyone present enjoyed listening to her talk about her interest in witchcraft and extensive research in preparation to write this book. She welcomed and answered questions until there were no more. New York City 1880. Highly enjoyable. Three witches that become the target for a fantatical member of the clergy and demons all around. Readers are once again introduced to Moth(from The Virgin Cure) going by the name of Adelaide Thom. Adelaide has opened a shop with another witch by the name of Eleanor St. Clair. Both are relieved to have the help of Beatrice Dunn, a young witch just learning her powers. I wanted to give up numerous times—the only reason I followed through upon completion of this book is it was a birthday gift from my, very observant, husband who knows I enjoy all things Gilded Age New York. I wanted to quit but because the tome was so akin to the kinds of places and times that I liked to be whisked off to I was desperate to salvage what aspects I did enjoy. The story was no doubt good...it just had a few underlying themes that I couldn't move beyond. I noticed that other low ratings were for the story being too slow or dull but I did not find that to be the case…perhaps because I enjoy what I call a “leisurely” read and don’t always require adventure or non-stop action to keep me engaged—but I do think, to be fair, this book seemed to have a good amount of excitement and was beautifully written for the parts I was engrossed in and not unsettled by. Unfortunately, those few objectionable features prevented me from being able to 100% enter into this story with complete abandon. It’s a shame, because I think this story had great potential but the author deviates into some territory that I was uncomfortable with and ironically enough it wasn’t even the supernatural facet that other low-raters remarked upon. I’m entertained by how the Victorian era was so gripped by the spiritual and supernatural and think it makes for an entertaining story for today's readers. This could have been awesome... but it was too preachy for me. Preachy about everything in it from the "religion" side to the "clairvoyants" to the "feminists" and "he-man woman haters". Is there truth in this? Appallingly so, however the presentation could have not berated the reader in the way that it did. Instead of letting a reader get immersed in the story, I felt as though I was constantly being poked to try to rouse me into a state of anger, shock and frothing of the mouth. Were there goo This could have been awesome... but it was too preachy for me. Preachy about everything in it from the "religion" side to the "clairvoyants" to the "feminists" and "he-man woman haters". Is there truth in this? Appallingly so, however the presentation could have not berated the reader in the way that it did. Instead of letting a reader get immersed in the story, I felt as though I was constantly being poked to try to rouse me into a state of anger, shock and frothing of the mouth. Were there good parts of this book? Absolutely there was some great character portrayal and some vivid illustrations, but they were lost in the author's obvious personal feelings. While painting the horrors (that yes actually occurred numerously by the "church"), the author actually was doing the exact same thing. I am far from a religious zealot and am predominantly out of tune with organized religion as a whole, but this was supposed to be a story not a sounding board to air grievances. It felt like an opinion piece from a place of hurt and anger instead. DNF at only 16 minutes in. A first! Screeching 1880s preacher complaining about women acting unseemly, a demon in the congregation whispering a spell that starts the witch hunts, and a couple of cutesy witchy women who sell charms from their tea shop. No offense, but NOT my cup of tea. Chick lit, magical realism, and at least one cartoonish character. The Witches of New York was too fluffy for me to love. I adore this kind of witchcraft and was charmed by the herb lore and spells but there is no grit to this book. I'm pretty sure New York City c.1880 had some grit. 2.5 stars rounded up. 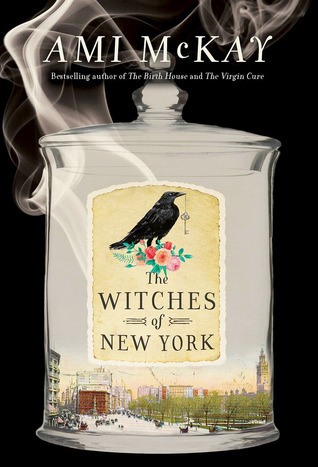 Set in New York City in the 1800's this novel focuses on the lives of three witches. Eleanor, descended from a long line of witches, Moth (now Adelaide) a see-er, and 17 year old Beatrice who is just beginning to realize her powers. Although flawed, the witches are enchanting and heroic. They cater to Manhattan's high society ladies, specializing in cures, palmistry and potions. They support one another and their secret potions to support women's health concerns. With many threads to follow this is Set in New York City in the 1800's this novel focuses on the lives of three witches. With many threads to follow this is a supernatural story full of magic, ghosts, fairies and a talking raven. A charming winsome tale of witches with a clever, talking, somewhat opinionated raven named Perdu who was my favorite. An atmospheric read about 3 witches in the 1880's in New York City. Having opened a small tea shop, Adelaide and Eleanor had their own style of witchery. Then Beatrice enters the picture as an apprentice and all hell breaks loose. I enjoyed parts of this novel. The descriptions of New York in the 1880's, the explanation of a womans life during that era, the account of the gritty city during those years, all made for a great read. The development of the three main characters was very good and made for easy comparisons and visualization. The magical realism was able to carry the story and helped to keep you turning pages. I do however think that the novel was much too long. There were many many side stories, all of which had to introduce a few more secondary characters. Most of these characters, which muddied up the overall story, in my opinion, seemed to pop in and then back out with no real relevance to the ongoing story. I LOVED this book! It's magical, alluring, beautifully plotted and full of fabulous characters, both human, and not-so-human (Oh, Perdue, you lovely raven you!). Plus, let's not forget that Victorian setting. Think of the child Edith Wharton might have had with Charles Dickens. In fact, McKay has used many of the Victorian Penny Dreadful tropes to splendid effect. Three women -- witches all -- in their shop, "Tea and Sympathy", a marvelous confection of place, as full of fairies (Dearies) as her I LOVED this book! It's magical, alluring, beautifully plotted and full of fabulous characters, both human, and not-so-human (Oh, Perdue, you lovely raven you!). Plus, let's not forget that Victorian setting. Think of the child Edith Wharton might have had with Charles Dickens. In fact, McKay has used many of the Victorian Penny Dreadful tropes to splendid effect. Three women -- witches all -- in their shop, "Tea and Sympathy", a marvelous confection of place, as full of fairies (Dearies) as herbs and potions (some for 'regulating the womb' if you know what I mean). The shop is a place of refuge and care for the women of the neighborhood. Frankly, I want one of these shops near me. Now, please. At the heart of this novel is something deliciously subversive: These women, who have suffered terrible loss and heartbreak, and who struggle under the yoke of Victorian patriarchy and hysteria, live with a quiet resolve and autonomy; they assist other women, they stand tall in their truth, and never deny who they are. i really like and respect ami mckay! i love how she digs deep into history, then spins it for fictional purposes. she's great at creating evocative places and times, and interesting characters. her previous novels - The Birth House and The Virgin Cure - were books i deeply enjoyed. The Witches of New York has us revisiting main character, moth (now 'adelaide'), from the virgin cure. so... all of this to say i was, of course, hugely and keenly anticipating the new novel. i tried very hard to keep i really like and respect ami mckay! i love how she digs deep into history, then spins it for fictional purposes. she's great at creating evocative places and times, and interesting characters. her previous novels - The Birth House and The Virgin Cure - were books i deeply enjoyed. The Witches of New York has us revisiting main character, moth (now 'adelaide'), from the virgin cure. so... all of this to say i was, of course, hugely and keenly anticipating the new novel. i tried very hard to keep my excitement and expectations in check, but sometimes it's difficult - excitement just bubbles up, you know? 1) it definitely feels like a set-up for a series (or at least a second, followup, book). though the novel ties up nicely enough at the end, there are aspects which are left undone, foreshadowing more to come. so some of the book felt like 'set-up' instead of a fully and completely realized whole unto itself. this was surprising to discover as i was reading. but i will read whatever mckay publishes - with hope i am not way out in left field on the series idea (i really don't think i am, heh). it would definitely be nice to get some resolutions to a couple of storylines within TWoNY! 2) the style of writing felt a little bit too YA-y to me. - not quite as mature or... insightful, perhaps, as mckay's style in her previous works. it felt a little more simplistic. the content of the novel is not something i would recommend to younger readers - it's definitely a book for adults or very mature readers in their late-teens. one of the primary characters is 17yo, so TWoNY could definitely be an attractive consideration for older teens. there is some sexuality (no too heavy at all), and sinister tension/mystery, so just be aware of those if you are considering the book for your mature teen readers. so... to sum up: i did quite like the story, characters, and mood mckay gives us in TWoNY. (and it's an absolutely perfect read for late-october!) i am also reading The Witches: Salem, 1692, by stacy schiff at the same time. this has actually been a fantastic paired read, with each book benefiting from the other, and overlapping with one another. yay! so i highly recommend that strategy, if you are into pairing a NF work with fiction. Originally posted at eternal escapist. Disclaimer: I received an eARC of this book from NetGalley in exchange for an honest review. First off, if you're looking for a book with a strong plot and a fast pace, then The Witches of New York is not going to be the book for you. However, if you're in the mood for something more atmospheric, then you're going to love this one. The Witches of New York followed the tale of three witches: Eleanor St. Clair, who came from a long line of witches; Ad Originally posted at eternal escapist. The Witches of New York followed the tale of three witches: Eleanor St. Clair, who came from a long line of witches; Adelaide Thom, a seeress; and Beatrice Dunn, a 17-year-old with a strong curiosity for anything supernatural who had just moved to New York. The book featured witch hunting, ghosts, and lots of magic. This was my first Ami McKay novel, and I loved her writing style. As I said above, she created the most incredible atmosphere. From the first page I was completely transported to another time and place - specifically, New York in the year 1880. I found the pace of the book to be a bit on the slower side, with a lot happening right at the very end, but I enjoyed the feel of the book so much that the slow pace didn't bother me too much. One thing I loved about the book was how McKay intertwined her fictional tale with the arrival of Cleopatra's Needle, an Egyptian obelisk, in New York City (an actual event that occurred during the time in which the book was set). The format of the novel also made the book something special. Throughout The Witches of New York were beautifully designed newspaper articles, tracts, spells, and stories. The main problem I had with this book was that I felt it lacked depth. It touched on a lot of different topics and plot lines, but many of them weren't explored as thoroughly as they might have been. There were just too many questions left unanswered. I thoroughly enjoyed reading about time in New York during 1880. This story involves three ladies who are discovered to be witches who run a tea shop and the problems they encounter with those wanting to rid the world of witches. Besides the three witches in the tea shop there are also the Dearlies who are in charge of dreams, a raven named Perdu who can talk and says he is not a bird and of course a ghost or two! The story is very cleverly written and it kept me engaged throughout the whole boo I thoroughly enjoyed reading about time in New York during 1880. This story involves three ladies who are discovered to be witches who run a tea shop and the problems they encounter with those wanting to rid the world of witches. Besides the three witches in the tea shop there are also the Dearlies who are in charge of dreams, a raven named Perdu who can talk and says he is not a bird and of course a ghost or two! The story is very cleverly written and it kept me engaged throughout the whole book. There is a small love story (or 2) within which is nice and a lot of mystical happenings. It was a very mediocre read for me. I didn't love it nor did I hate it. It was jus all right, and I'll probably forget about this book soon. It had it enjoyable moments, and at the beginning of the story I was hooked, the writing and the scenery were marvelous and I just wanted to read and read about those three witches of New York - Eleanor St. Clair, Adelaide Thom, and Beatrice Dunn. Eleanor and Adelaide run a tea shop in NYC, and Adelaide secretly posted a job announcement in a paper to look It was a very mediocre read for me. I didn't love it nor did I hate it. It was jus all right, and I'll probably forget about this book soon. It had it enjoyable moments, and at the beginning of the story I was hooked, the writing and the scenery were marvelous and I just wanted to read and read about those three witches of New York - Eleanor St. Clair, Adelaide Thom, and Beatrice Dunn. Eleanor and Adelaide run a tea shop in NYC, and Adelaide secretly posted a job announcement in a paper to look for help for an overworked Eleanor. This is when Beatrice joins their tea shop, a girl that appeared too late and after all the other girls that wanted the job were dismissed by Eleanor. But she's different, she was let into the closed shop by a ghost of Adelaide's mother, an event that truly scared Beatrice who is yet to discover that she can see communicate with ghosts. The story seemed really interesting at the beginning, but then it all just lost it's charm and ended up being quite boring. The blurb for the book spoils the event that is supposed to be the main plot point that fastens the pace of the story towards the end and brings some tension. But I know about it from the beginning and I was just confused till the third-fourth part of the book why does this didn't happen yet? The three main characters are likable and I enjoyed reading about them, but the plot was just weak and very predictable. There is a preacher that is excusing his horrible actions toward women who he believes to be witches because of his faith and believe that he is doing the God's work. This man was the most infuriating character in the story, I got so angry every time he appeared. I must say that he is a very well written villain. Overall, quite boring and predictable read. Ended with a lot of unanswered questions which brings the possibility of a sequel? If yes, I won't be reading it. "What is the weight of a soul? Where does it go when we die? Are there such things as ghosts? Can they speak to the living? What of spirits, demons, fairies and angels? Can dreams hold portents, visions, foretellings? Are witches real? Does magic exist?" I've never liked it when witches are portrayed as ugly old evil hags. After all the accused were real women who burned at the stake. I believe the reality deserves respect. When I think of the word witch I think of a strong, intelligent independent woman and that is why I thoroughly enjoyed The Witches of New York. It focuses on strong female relationships; women supporting other women in turbulent times. I was pretty indifferent towards the book until about the 20% mark when Beatrice spots an ad in her local paper for an assistant in a tea shop. The ad says that "those averse to magic need not apply." At this stage my interest piqued right along with Beatrice and it was wonderful to see her grow as a character throughout the book. She turns from a meek small town girl into a woman both Adelaide and Eleanor can depend on as a worker and as a friend. It was also interesting to see how acceptable witchcraft and belief in the occult was at this time. Wealthy women flocked to the shop for reading and herbs to help with various ailments. "The witch was in reality the profoundest thinker, the most advanced scientist of those ages. The testimony of the ages entirely destroys the assertion sometimes made that witchcraft was merely a species of hysteria." I really loved this part of the book. I found the spells and potion making really interesting and absolutely loved the snippets from Eleanor's grimoire. I'd read that as a stand alone if it was available! For the most part, until near the end the novel is driven by memorable characters supported by wonderfully authentic writing. The slower pace for the first 80% did not affect my interest in the slightest as I revelled in the detail of it all. The only character I would have loved to have seen more of was The reverent, simply because he was so devious and it added great tension to the story. The addition of other characters near the end also has me longing for a sequel to this story! I can highly recommend The Witches of New York. It's a rich, submersive story that is just perfect for this time of the year. "What wonderful beings they were, these women he’d come to care for, these women who’d helped him chase his dreams, these women he needed so much more than they needed him—these marvellous, glorious, Witches of New York." This was a feast for the eyes, ears and everything in between. If I wasn’t fully immersed in the gritty, dirty streets of New York, the buzz of the city and its gothic looking architecture, I was mesmerized from the very beginning by the world of witchery and witchery goings on. I don’t think it would be too much of a cliche to say I was spellbound would it? Well, I make no bones about it – I was. So much so I spent far too much time researching and looking at the information the author provides at the end of the book. Madison Square Park is noted for witchery goings on and there are tunnels under the city? This story captivated me and I was so destitute when it was finished that I rushed out and bought James Morrow The Witchfinder and am going to reread Ami’s book again just before Halloween to make me feel all mystical. I got an arc from the publisher in exchange for my honest review, all opinions are my own. This book was so much more fun than I expected it to be! The reason why I did not give it 5 stars is because apparently some of the characters are from another book by this author. This doesn't seem to be a series but I did feel like I would have enjoyed the novel more if I had read the other book first (The Virgin Cure). I don't know how well I would have gotten to know the characters if I had but it did f I got an arc from the publisher in exchange for my honest review, all opinions are my own. The reason why I did not give it 5 stars is because apparently some of the characters are from another book by this author. This doesn't seem to be a series but I did feel like I would have enjoyed the novel more if I had read the other book first (The Virgin Cure). I don't know how well I would have gotten to know the characters if I had but it did feel like I was only scratching the surface of their personality and backstory. I would have liked to see more so that we got to know them better and connect even better with the characters. the help they gave to women in need at a time when contraceptives were illegal, the nods to the treatment of women deemed "insane," and the obvious allusion to the witches being those who were simply far ahead of their time. The real charm is the connection to the reality of women's struggles in this time period paired with the quaint and enchanting bits of magic. My one issue with the book is that I felt there were a few plot elements that could have been explored more, and would have been more worthwhile if tied to the story to a larger extent. 3.5 "Gilded Age America/Witches" Stars for the story and 5 Stars for the narration. Interesting in its account of religious persecution of witches in the Gilded Age in New York, as well as, high societies' use of witches to fix all types of ailments and concerns (in the late 1800s). However, it jumped back and forth quite a bit (even between secondary characters) and I had a bit of trouble with it keeping my attention. If you're debating reading or listen, I recommend listening as the narration by 3.5 "Gilded Age America/Witches" Stars for the story and 5 Stars for the narration. If you're debating reading or listen, I recommend listening as the narration by Julia Whelan was great. It takes place in New York in the 1800’s which gives way to amazing and intriguing world and character building! I loved the strong female characters who happened to be the witches and I loved the psychotic reverend who was trying to rid the world of “evil by getting rid of witches. It’s so easy to get lost in this world of dynamic characters and it was such an interesting journey. I did knock off one star, however because the pace did slow down quite a bit in some pa This was such a great book! It takes place in New York in the 1800’s which gives way to amazing and intriguing world and character building! I loved the strong female characters who happened to be the witches and I loved the psychotic reverend who was trying to rid the world of “evil by getting rid of witches. It’s so easy to get lost in this world of dynamic characters and it was such an interesting journey. I did knock off one star, however because the pace did slow down quite a bit in some parts and it felt like some of the dialogue and a few characters were just not necessary to the story. Aside from that, I lived this! I picked up this book and within three pages it had me hooked, utterly and completely charmed by this tale of witches in NYC right before the turn of the century. I've heard it compared to Jonathan Strange & Mr Norrell, but where I remember that book as cold, sharp, silvery, this book was warm, full, golden. The difference between magic weilded by men as opposed to magic crafted by women? Perhaps. I have spent the last few days enamored with the idea of magic woven all around us, in the subtl I picked up this book and within three pages it had me hooked, utterly and completely charmed by this tale of witches in NYC right before the turn of the century. I have spent the last few days enamored with the idea of magic woven all around us, in the subtle support and uplifting between friends, in our little flashes of insight, in the perfectly chosen cup of tea. This book grabbed me and wrapped me in a warm quilt of words. I will be surprised (and delighted) if anything else I read this year is as wonderful (in timing as well as story). There must be a bad guy in most stories and this is no exception. And yes, there are a baddie or two (or three), but honestly the scariest part were the real life counterparts, arresting women or throwing them in mental wards for "morality" issues. This book felt meticulously researched, too, I Googled a few things because I wanted to know more more more, the author did a great job of pulling me into the time and making it seem as magical as the main characters. Her new novel. The Virgin Cure, is inspired by the life of her great- great grandmother, Dr. Sarah Fonda Mackintosh, a female physician in nineteenth century New York. Born and raised in Ami McKay’s debut novel, The Birth House was a # 1 bestseller in Canada, winner of three CBA Libris Awards, nominated for the International IMPAC Dublin Literary Award, and a book club favourite around the world. “When do I get to do that, Maman? ", she´d asked. "When do I get to say whatever I wish?" "When it pains you not to," her mother had replied. "What if I´m too scared?"